Guaranteed service- no recharge for a return visit. From £45 + vat per nest. Wasps are easily Identified by their bright yellow and black stripe bodies and are not choosy who they sting. In fact they can sting more than once, several times in fact when defending a nest from what they have decided as a potential threat to themselves or maybe a nearby nest that is not obvious at the time, you have simply stumbled upon it, which could be a painful experience. 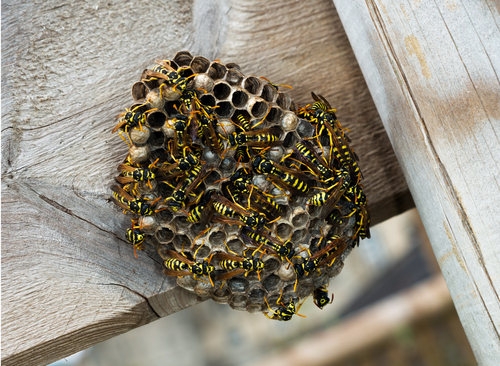 As well as being regarded as an angry stinging freely insect, wasps do actually play an important part in our ecosystem. Wasps feed on other insects and will readily take flies, including bluebottles on the wing to take back as food to their nest. Other insects include aphids etc so they really are a gardeners predatory friend, similar to a spiders role but with a sting in the tale – I wonder if all Wasps horoscope sign is a Scorpio! During our hot summer days that we’ve all been dreaming of during our cold winters, come with increased pest activity, such as Flies, Bugs, Beetles, Mosquitos, Horse Flies, Biting Midges, Hornets and the dreaded angry Wasp. Khitan Bird and Pest Solutions are a local Shrewsbury based Pest Control and Telford Pest Control provider that offers a quick, same day response on the days you need our services, including weekends and out of normal working ours.. Usually quoted as being 24/7. Ranging from Wasps, Bees, Insects, Beetles, Flies and Bugs to Rodents & Moles. Birds such as Pigeons, Seagulls, Ground Nest Birds pre-new building development works, House Martins Corvids. Black Garden Ants, Tropical Ants, Rabbits, Fox, Mink, even Newt management.